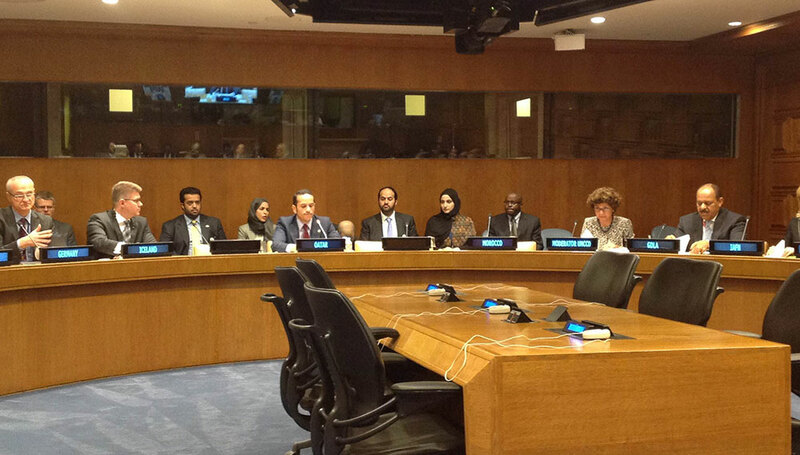 On the sidelines of the 69th United Nations General Assembly in New York, the Executive Director of the Global Dryland Alliance (GDA), H.E Ambassador Bader Al Dafa has taken part in the high level side event held on September 23, 2014 under the title “Food Security, response mechanisms and resilience: Global Dryland Alliance a model”. The side event was organized in cooperation with permanent delegation to the United Nations of the State of Qatar, the Federal Republic of Germany, the Kingdom of Morocco, and the Republic of Iceland. The meeting was attended by a number of countries supporting the GDA initiative, high ranking officials of UN specialized agencies like the World Food Program (WFP), the Food and Agriculture Organization (FAO), and the UN Convention to Combat Desertification. H.E Bader Al Dafa has addressed a detailed presentation about the alliance, focusing on the vision, mission, objectives and innovative mechanisms to be implemented in programs and projects, which will complement the existing international efforts to ensure food security in dry land countries and contribute to the international peace and security. The participants to the event have reaffirmed the support of their countries and organizations to the initiative, considered as a model of joint efforts to face serious challenges in over 50 countries worldwide suffering of drought and desertification, food insecurity and risks of wars and crisis as a result of hunger and poverty.